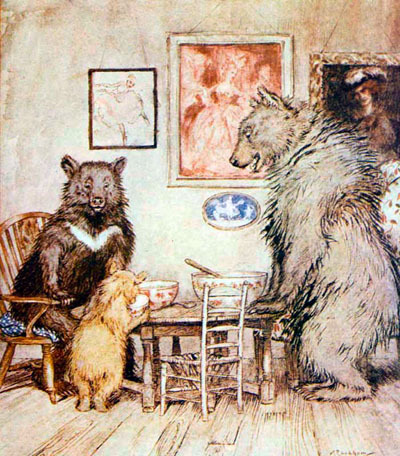 One day, after they had made the porridge for their breakfast, and poured it into their porridge-bowls, they walked out into the wood while the porridge was cooling, that they might not burn their mouths by beginning too soon, for they were polite, well-brought-up Bears. 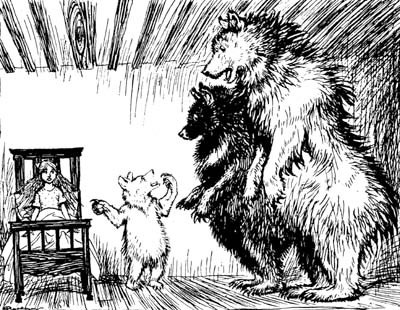 And while they were away a little girl called Goldilocks, who lived at the other side of the wood and had been sent on an errand by her mother, passed by the house, and looked in at the window. And then she peeped in at the keyhole, for she was not at all a well-brought-up little girl. Then seeing nobody in the house she lifted the latch. The door was not fastened, because the Bears were good Bears, who did nobody any harm, and never suspected that anybody would harm them. So Goldilocks opened the door and went in; and well pleased was she when she saw the porridge on the table. If she had been a well-brought-up little girl she would have waited till the Bears came home, and then, perhaps, they would have asked her to breakfast; for they were good Bears – a little rough or so, as the manner of Bears is, but for all that very good-natured and hospitable. But she was an impudent, rude little girl, and so she set about helping herself. And upon the pillow – – ? There was Goldilocks’s yellow head – which was not in its place, for she had no business there.